Aside from the kids' special programs and school events, what I really look forward to are their exposure trips. Last November we had a field trip to Subic, Pampanga. Our first stop was the Zoocobia Family Fun Zoo. Zoocobia is much more than a place to view animals; it is a complete educational and interactional experience. Set in the beautiful, forested foothills of the Paradise Ranch, Zoocobia is an ecological experience of impressive proportions. Children love seeing the numerous animals at close quarters and are able to feed the animals by hand for a small fee. It is also perfect for large groups from schools, churches or other organizations who will love the unique animal experiences and setting. Zoocobia Fun Zoo, which is derived from the combined name of the three mascots (Zooc, Cobi and Bia), is located on top of Sacobia Valley. It includes the Zoocobia Barn houses animals such as pigs, goats and camel. There are animal-feeding encounters, including love birds, ostrich and Southeast Asian bearcat. There’s a big-bird exhibit, not the one from Sesame Street, but various big birds in an open space for the kids to explore. For 20php, you get to be inside the huge lovebirds' cage, and feed them. 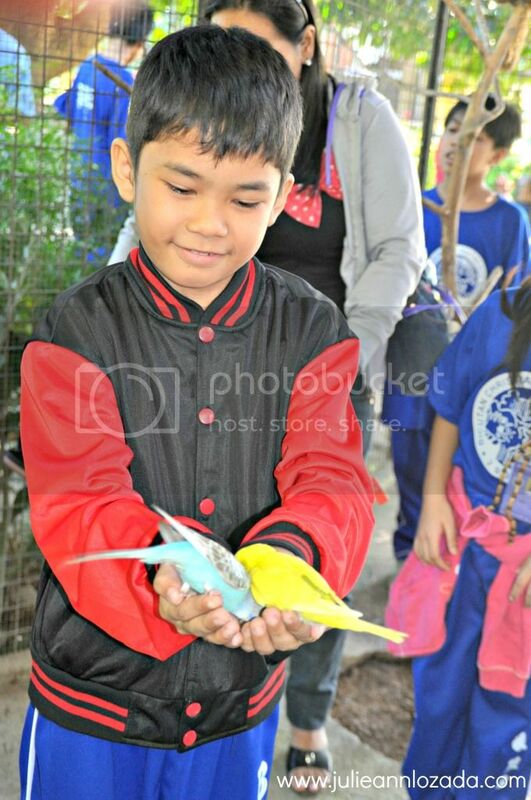 Even kids are enthralled when the lovebirds fly into your hands. This ostrich continuously pecked apple's hand for some food pellets! For Php20, you'll get to experience feeding this gigantic bird. For Php20, you can feed the goats with a small bottle of milk! I bring home something from the Souvenir Shop. I never had the chance to take a photos of the whole Zoocobia, for more photos, tour/field trip packages and rates, contact numbers, address and other infos, just visit their websites - HERE and HERE! Upon entering the factory we were immediately reminded of what it was to be a kid in the excitement of knowing how Creamline ice cream was created. They give us 10 to 15 minutes journey throughout the entire Creamline ice cream making process. Plus they give each one of us their signature Double Dutch Premium Cone ice cream. Oh, thanks Creamline. wow!! that looks like a fun trip!! i laugh when you say it's nothing like sesame street! hahaha!! Nice! I haven't try visit zoo in the Philippines. But, all the photo of you are look great. I am sure dat was fun.. Have a good weekend. This looks like so much fun. Very different from anyplace I've been. Also, love your outfit, especially your purse. I'm your follower on GFC and bloglovin...would love for you to do the same! Its been long since the last time i visit a zoo! this like kissing childhood! I miss doing this! oh i love all the animals! great pictures! such cool pictures:))thank you so much dear:)) I am now following you too on facebook!! :) I have a new post now and would love to know your opinion on it!! so cute & love the photos! Thank you so much for your comment! Hope you will continue visitng my blog, thanks!